"The strength and dedication of a well-trained hunting dog is a beautiful sight. doing what he was born to do. Pure instinct and training at magnum force. a good bird dog. His reputation as The Sportsman's Artist is well deserved. He is an artist who paints from personal experience. 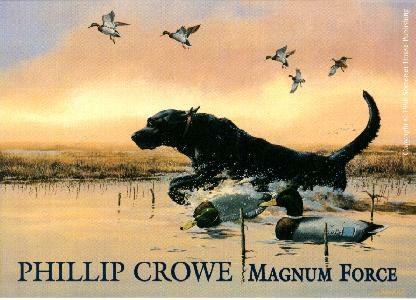 "Magnum Force" by Phillip Crowe. Collector Edition ____20 1/2" x26" * 750 Limited edition S/N.